Perched above the breathtaking Pueblo Bonito Sunset Beach Resort, stunning contemporary Villa Mestre is a luxury getaway like no other-one of the most exclusive and private properties in Cabo San Lucas and the only property on its hilltop location. This spacious 10,000-square-foot home blends striking modern architecture, unbelievable panoramic vistas of the Pacific Ocean, and all the creature comforts for an incomparable vacation retreat. There are few vacation rentals in Cabo San Lucas that can boast this winning combination of privacy, scenic beauty and exceptional amenities—including access to the award-winning dining and facilities of the Pueblo Bonito resorts. Villa Mestre is definitely your best option to make an unforgettable sojourn. Interior living spaces open up to an expansive 25,000 sq. ft. outdoor area including lush landscaping, lawns, a cliff-front swimming pool, a fire pit with seating area and an inviting infinity jacuzzi. Admire sunrise and sunset views and sip a cocktail at one of the outdoor lounge areas and keep an eye out for cruise ships and migrating whales. You’ll feel like you’re on top of the world, with a view encompassing the twinkling lights of the resort below, broad swaths of inviting beach and the rock formations of Land’s End. Inside, understated luxury meets sophisticated design, with stylish modern furnishings, white walls, marble and decorative stone. There’s plenty of room for you and 17 friends, with 7 comfortable suites, each offering a balcony terrace or a beautiful garden view. Enjoy a full access to Pueblo Bonito´s Breathtaking Pacific Ocean views, unique restaurants and bars, shuttle service between sister resorts. We invite you to step into a world of unforgettable moments at Quivira golf course that offers more oceanfront exposure than any other course in Los Cabos, with panoramic views of the Pacific from every hole. Be our guest at our award winning spas where you can relax and rejuvenate with holistic spa rituals and body therapies at the most beautiful spas resorts in Cabo San Lucas. Unique and sure to impress, this villa is truly in a league of its own. NOTE: Villa Mestre can accommodate wedding parties/special events for 20 guests (sit down or standing). There is a minimum stay requirement, an extra event fee plus any applicable permit fees. 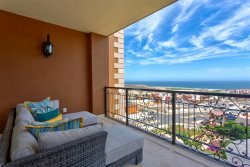 MAIN FEATURES 10,000 Square Feet 2 Levels 7BR/8BA Sleeps 12 adults + 6 children maximum Ocean view with amazing views of Pacific Ocean Open access to Pueblo Bonito Sunset Beach, Pueblo Bonito Pacifica, Pueblo Bonito Rose and Pueblo Bonito Blanco. Guests have access to Quivira Golf Course Signing privileges to all these properties Property Amenities Master Suite: Private entrance, King bed, walking closet, ocean view, balcony/terrace, private bath w/Jacuzzi tub Second Suite: King bed, walking closet, ocean view, balcony/terrace, private bath w/Jacuzzi tub Third Suite: 2 Queen beds, walking closet, ocean view, balcony terrace, private bath w/Jacuzzi tub Fourth Suite: 2 Queen beds, closet, ocean view, balcony terrace, private bath Fifth Suite: 2 Individual beds, closet, private bath Sixth Suite: 2 Individual beds, closet, private bath Seventh Suite: King bed, closet, ocean view, terrace, private bath Security guard onsite Free shuttle to Pueblo Bonito Hotels Maid Service: Daily Access to Pueblo Bonito Golf, Fitness Centers and Spas EXTENDED LIFESTYLE SPECIAL – Book now and receive every 5th Night Free! Do not miss the opportunity to experience Villa Mestre! Valid on new reservations only. 5 night minimum, may not be combined with other promotions. Restrictions apply, subject to availability and blackout dates.